Why You Should Use Nutmeg Essential Oil! Are you looking for a beneficial essential oil to add to your home collection? Then nutmeg essential oil is an oil that you definitely need to try! Nutmeg is also an excellent fall and Christmas essential oil in addition to being very useful! I love all Essential Oils, but I especially love Christmas Essential Oils! And just as I said in my post about Ginger Essential Oil, Nutmeg is a great Christmas oil! Both of these oils are two of 10 Essential Oils that are also great for Fall! First let’s look at the scientific name of the Nutmeg that I use. It is Myristica fragrans. This might not seem important, but trust me, it is! Some essential oils have lots of different species. Some of these species can be harmful. But, some varieties of eucalyptus essential oil can actually stop a small child’s breathing! We’ll discuss this more when we discuss eucalyptus in a future post! 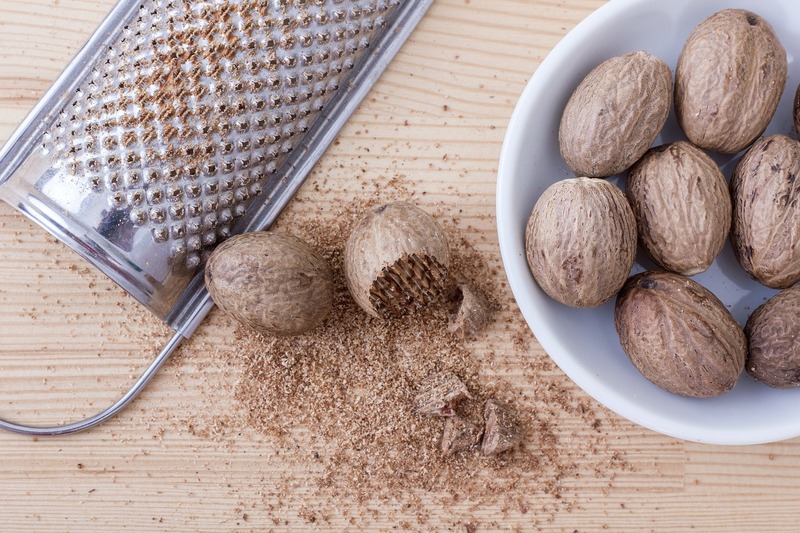 What is nutmeg and where does nutmeg come from? 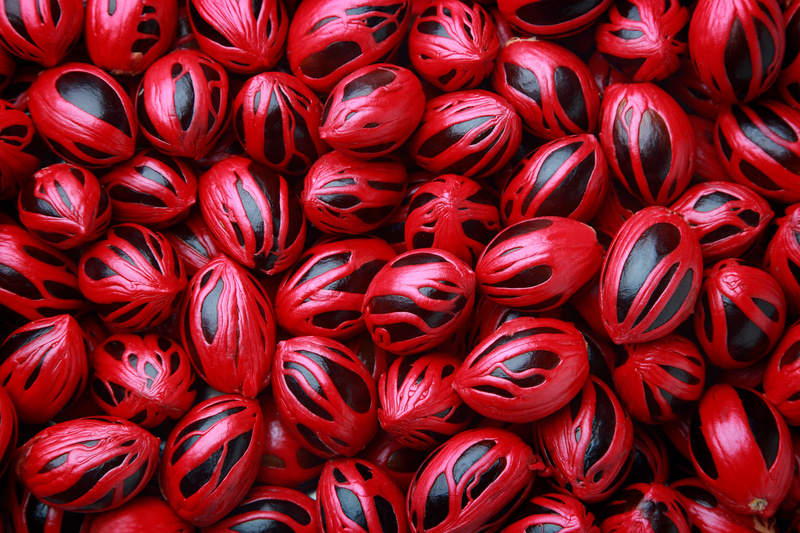 The essential oil is obtained by steam distillation of the dried ripe seeds. The picture here is of dried nutmeg. The red picture above shows what nutmeg looks like fresh. Aren’t they pretty?! The Nutmeg essential oil that I use is wildcrafted and is harvested in Sri Lanka. The color of Nutmeg essential oil can range from colorless to yellow. What does nutmeg essential oil smell like? Nutmeg has a spicy, woody, pungent scent. The scent blends well with these additional 14 Christmas essential oils! Nutmeg is used to flavor many different foods, both sweet and savory. I love the flavor of nutmeg and use it in my Sweet Potato Pie Mashed Potatoes. It is said that the people of India learned to use nutmeg from the Indonesians through ancient trade routes. So now that we’ve discussed name, origin, scent and history, let’s delve right into the benefits of nutmeg essential oil! Let me first say that I am not a doctor! All of the information that I provide on this site is for educational purposes only and is in no way intended to diagnose, treat or prescribe. Please read my disclaimer page and/or the disclaimer at the bottom of this page for a full disclaimer statement. Nutmeg essential oil in the home. Nutmeg will leave your home smelling yummy and give it the feel of fall or Christmas! It is a great scent to diffuse during the fall and winter months! It is one of the oils that I discuss in my post 10 Essential Oils To Use This Fall, as well as 15 Essential Oils To Use This Christmas! Some of the other ways to use your fall and Christmas scented oils around the home are discussed in my post 10 Ways To Use Your Fall Essential Oils, and 12 Ways To Use Your Christmas Essential Oils! Be Young Total Health discusses Nutmeg essential oil on their website. Be Young says that nutmeg has shown in many studies to be a natural option for digestive problems, arthritis, and other inflammatory health conditions. Valerie Ann Worwood, in her book The Complete Book of Essential Oils and Aromatherapy, also lists Nutmeg as being beneficial for nausea, vomiting, muscular aches and pains, nervousness and insomnia. Dr. Kurt Schnaubelt Ph.D., lists Nutmeg, in addition to Clove essential oil and Ginger essential oil, as a great essential oil to use during the fall and winter to reduce the symptoms and shorten recovery time of respiratory conditions such as influenza, bronchitis, pneumonia, sore throats and the common cold. You can read more about this and get his recipe in his book The Healing Intelligence of Essential Oils. My favorite nutmeg essential oil uses! Some of my favorite ways to use Nutmeg essential oil are listed in my posts 10 Ways To Use Your Fall Essential Oils, and 12 Ways To Use Your Christmas Essential Oils! 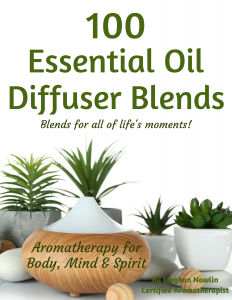 You can also find a great Christmas diffuser recipe for Nutmeg listed in my eBook 100 Essential Oil Diffuser Blends! Nutmeg essential oil should not be used in large amounts due to its chemical content that has been said to contain hallucinogenic properties. Because of it’s ability to stimulate, Nutmeg should not be used by those with epilepsy. Nutmeg essential oil should be used with caution during pregnancy and should be avoided with young children. Be sure to consult your health care provider before using to be sure that Nutmeg is safe for you. You also want to make sure that you are using a good quality Nutmeg. As an Aromatherapist I would never recommend buying an essential oil at a local store. I can almost guarantee you that it is not a pure oil. 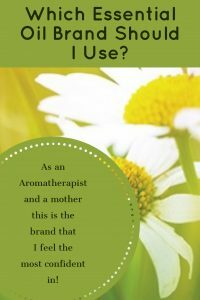 Which Essential Oil Brand Should I Use? Make sure that you know and trust your source. If you have a brand that you feel confident in you can use that. 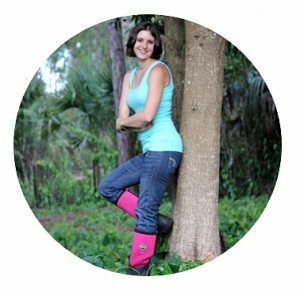 If you aren’t sure about where to get Nutmeg, or if you would like to check out the brand that I use, you can find it on my business website Healing Blends For Life. I hope you enjoy Nutmeg as much as I do! I love using Nutmeg during the fall and Christmas seasons! What do you like most about Nutmeg? Do you enjoy the smell as much as I do? Did you experience any results after using Nutmeg? If so what were they? Do you have any additional uses to add to the above list?